The Coeliac UK Plymouth Group are holding their latest event at the Elm Community Centre, Estover on Saturday November 1st between 1pm and 4pm. A gluten free food and craft fair will be held giving those requiring a gluten free diet in Plymouth a fantastic opportunity to stock up on some really great locally produced GF goodies. The event is open to non-members so I hope that all Gluten Free by the Sea readers will come along on the day and get your hands on a wide variety of sweet and savoury treats. Full details of the event from the Coeliac UK Plymouth Group can be found below. The committee invite you to join us at the ELM Centre, ASDA Plymouth, for a gluten free food and craft fair. For new members we will be available to give help with such things as prescriptions and best places to purchase gluten free products. This will be a great opportunity to stock up on gluten free products from some of the finest local suppliers. Let Them Eat will be present with their delicious cakes, Pomeroy Rare Breeds will have some fantastic GF pies and dairy free ice cream, a dietitian and nutritionist called Julie Sargent will be available and we’ve even got gluten free dog food available from K9 Pet Foods. Westcounty Produce, Jackson’s Bakery and Sarah’s Tasty Treats will all be selling are a variety of sweet and savoury GF products. Everything will be gluten free! There are more traders set to confirm and we will also have a number of craft stalls selling items in the lead up to Christmas. Glutafin, Juvela, Feel Free For Gluten Free, Nature’s Path and Perkier Foods have all donated free samples for members or raffle prizes. In the Elm Centre we will have use of the excellent kitchen facilities, were Tea’s, coffees, biscuits and cakes will be available after 2pm. For all you bakers out there, we welcome you to bake and share with other members. There will be a £1 voluntary entrance fee to the meeting and members are also encouraged to bring unwanted prescription items for new members. We are looking forward to seeing you on the 1st November 2014. Doors will open at 1pm with the food fair running until 4pm. We sincerely hope you can attend, and trust you will have a great time. For any of you who do not know were the ELM Centre is, it is located in Estover Plymouth adjacent to the ASDA Store. If at the ASDA main entrance, turn right down the steps and the centre is at the far end of the courtyard. Full address is Leypark Court, Leypark Walk, Plymouth, PL6 8UE. There is some community centre parking, otherwise you can park in the overflow ASDA car park for 3 hours. There are regular bus routes to the ASDA store, the number 50 City Bus. You can catch the 27 or 27a if travelling from the City Centre. 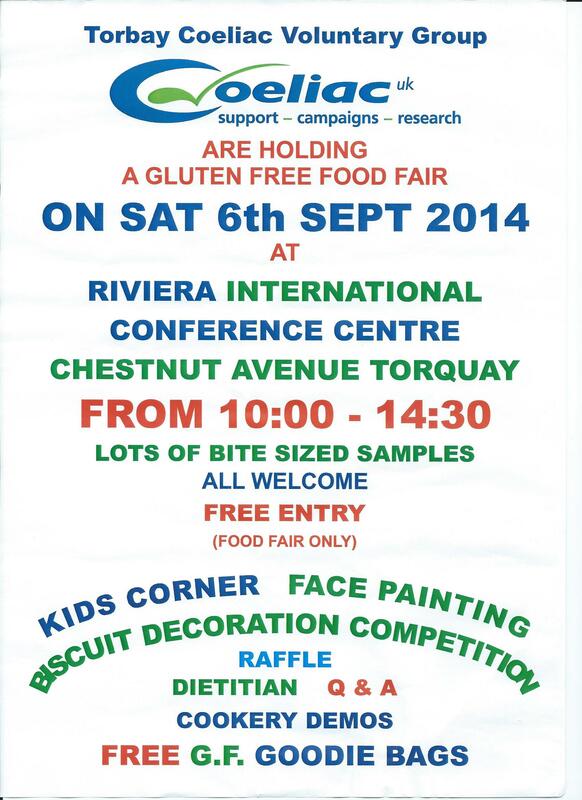 The Torbay Coeliac Voluntary Support Group are having a gluten free food fair next Saturday 6th September from 10am to 2:30pm. The event is being held at the Riviera International Conference centre, Chestnut Avenue, Torquay – which was the venue for last years successful event. Exhibitors include national brands such as Juvela, Glutafin and Warburtons and a host of local companies such as Jackson’s Bakery, Kay’s Cakes and Born to Bake. There will be plenty of free tasters, goodie bags, dietitians from Coeliac UK and Kids Korner. I visited last years Torbay food fair and it was well worth a visit. I believe that last year’s event was so successful that the event has been moved to a bigger hall this year. 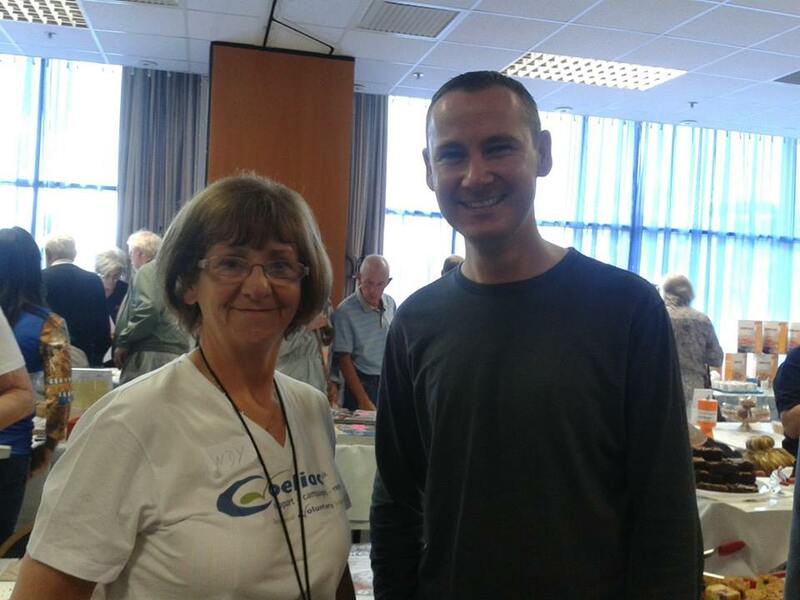 I wish Torbay Group Organiser Wendy Smeaton and her team another very successful day! Below is a photo of Wendy and I at last years event. Kevin, Gluten Free by the Sea. Please see the details below of the upcoming Coeliac UK Plymouth Group event that will be held in conjunction with the Mount Edgcumbe local produce market on Sunday September 10th. Please note that the market itself is not organised by the Coeliac UK Plymouth Group so will not be entirely gluten free, but all traders are aware of the coeliac event and will be ensuring they have gluten free options where possible. This is a re-arranged event following the postponement of the August due to severe weather conditions. The Coeliac UK Plymouth Group invite you to join us for a tour of Mount Edgcumbe House on Sunday September 14th. The standard ticket price is £7.20, but we have negotiated a special price of £3 for members and their guests. We ask you to meet us for registration at 11am for 11.30 entry. Tea and Coffee will be available upon arrival as will samples of gluten free cake and savoury items. The house takes about 1.5 hours to explore. All members and guests must register in advance, stating name and email address, or phone number. This is then to be checked off on the day. Any members needing assistance between the Cremyll Ferry and the house to notify us upon initial registration so we can ensure golf buggies are available. Meeting point for the buggy is at the lower gate to the park. Please be patient as once the buggies are full we will be back until everyone has been picked up. Please email coeliac.plymouth@gmail.com to register by completing and returning this form; money will be collected on the day. If you have any problems finding us on the day please visit the Let Them Eat Cake stall at the produce market where someone will be able to direct you or call 07743 792368. After your time looking around the house please reconvene back at the Earls Garden for more refreshments, and a wonder around the produce market. Those not wishing to take part in the house tour are welcome to meet us in the Earls Garden from 1pm to enjoy refreshments, where committee members will be available to give advice and answer any queries. The market is a monthly event, showcasing the finest produce from within the Tamar Valley. Every trader at this market has been fully briefed on our event and all are putting a great deal of thought and effort into their offer for you. You will be able to purchase goodies such as gluten free sausages, chilli jam, thai green curry, cider, apple juice, honey, fresh flowers, fresh Tamar Valley fruit and veg, jam, cake, pasties, pies, sausage rolls, bread (that doesn’t break down when you make a sandwich), everything you could need for a picnic, Sunday supper, or to fill the freezer. Please be aware that the market is not being organised by the Coeliac UK Plymouth group, so do check with traders to ensure any purchases are gluten free. There will of course be produce available for our non-gluten free family so please be careful. After this please take the time to enjoy the stables courtyard where you can find weaving and whittling workshops, an up cycled store, art, spa treatments, new children play area, frisbee golf and segway. This is a day out for all of the family, so please do bring them along and if the weather stays like this we will have the most wonderful time.